Welcome to Fairford, Gloucestershire, a town where Walkers are Welcome, and a good place to visit. Fairford, 9 miles east of Cirencester, is beautifully situated between the Upper Thames Valley and the Cotswold hills, on the edge of the Cotswold Area of Natural Beauty and within the Cotswold Water Park. The picturesque River Coln runs right through the town with several large lakes on both east and west sides. There are miles of river and lakeside walks, footpaths and bridleways waiting to be explored, as well as a unique range of heritage assets. 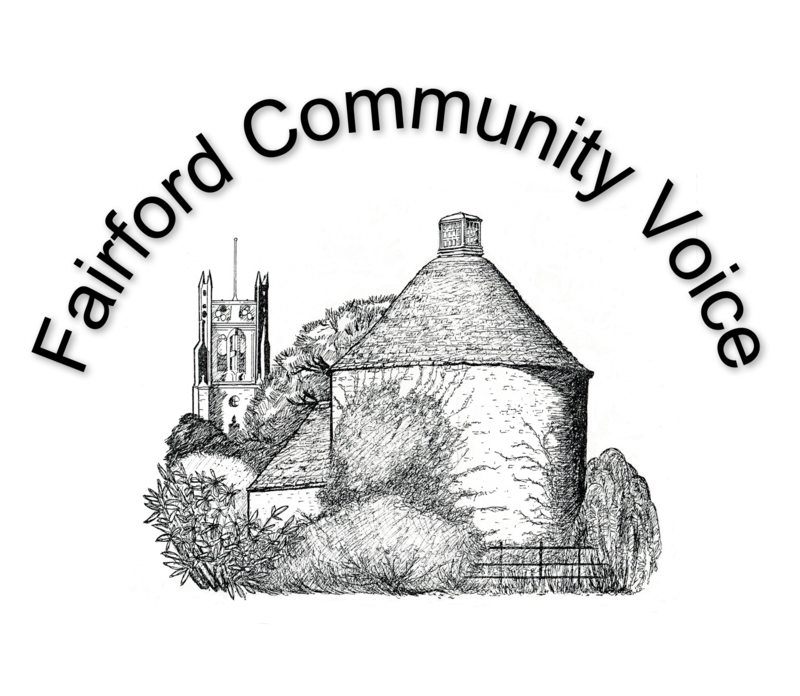 The ‘fair ford’ river crossing was established in Anglo-Saxon times, and Fairford prospered and grew from the wool trade in the Middle Ages, but excavations have also revealed Iron Age, Roman and Saxon settlements in the area dating back from 400 BC to 800 AD. The long history of the town is reflected in its layout and in the many historical buildings and walks in and around the town, including the ancient mill, the landscaped park and old drove roads. The ‘jewel in the crown’ is the 15C St Mary’s church, one of the finest parish churches in the country, which contains a unique complete set of medieval stained- glass windows which have survived reformation, iconoclasm, civil wars, the flight of Concorde, great storms and the ravages of time for more than 500 years. Whilst steeped in history, Fairford is also a modern town with a thriving market, held every Wednesday in its historic market place in front of the Bull Hotel, retail and coffee shops, and four pubs. An annual Fairford Festival is held in June as well as regular food/drink events and a Christmas market in the market square. Fairford is also famous for hosting the annual International Air Tattoo at the nearby Fairford Airbase. 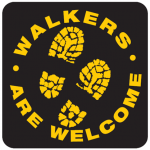 Walkers are Welcome is a national organisation of towns and villages with something special to offer walkers. 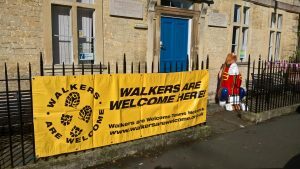 Fairford is a Walkers are Welcome Town, and you will see stickers in the shops, pubs and cafes confirming that they give a big welcome to all walkers. There are information boards on many of the walks describing the local flora and fauna at various locations. A Fairford Walking App is being prepared and will include additional walks in the area, and new walks brochures are being printed. A longer circular walk from Fairford to Quenington and Coln St Aldwyns is now shown on the Cotswold Pub Walks App (available from the App store – produced by Tiny Rocket Apps). Note: due to the last hard winter and dry summer, some of the walks are, in places, in poor condition but a programme of improvements is now being implemented through the Fairford Countryside Group involving members of Fairford Town Council, Fairford Walkers are Welcome and the Farming and Wildlife Advisory Group South West (FWAG). This will include improved surfacing, signposting and the introduction of a circular river and town walk accessible to people with disabilities. ‘Fairford Walkers are Welcome’ is a community group run by volunteers for the benefit of the local community and visitors to the Coln valley area. Our remit includes developing and promoting walking activities, maintaining and improving footpaths, organising Walking Festivals and working with supporters and partners including Fairford Town Council, Cotswold District Council and other like-minded organisations for the benefit of the recreational walking community. There are always jobs to do and new projects to develop, so if you have any ideas or would like to be involved please contact us through www.fairfordcv.org.uk. We are proud to be part of the Walkers are Welcome UK Network. 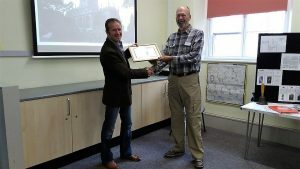 Fairford was launched as a Walkers are Welcome town on Saturday 9th September, 2017 at the Fairford Heritage Day and the WaW membership certificate presented to Fairford’s Deputy Major, Mark Dudley. The certificate will be displayed in the Fairford Community Centre. WaW window stickers and brochures have been distributed to all cafes. pubs, hotel/b&bs in Fairford with very positive responses and the Fairford WaW committee will now be meeting to discuss and plan on-going WaW activities in and around the town.